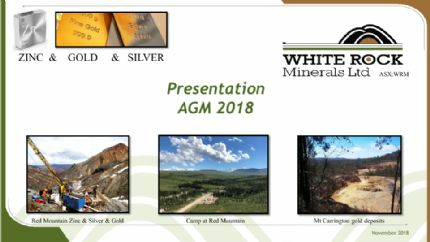 White Rock Minerals Ltd (ASX:WRM) is an Australian listed minerals exploration and development company with projects located in northern NSW (gold and silver) and central Alaska (zinc, silver, lead and gold). The White Rock vision is to explore and develop both precious and base metal projects. White Rock's cornerstone asset is the Mt Carrington epithermal gold-silver project in northern NSW. The Mt Carrington project has great leverage to the Australian gold and silver prices with a positive scoping study providing a path towards feasibility studies and development in the near term. White Rock is also exploring the Red Mountain project in Alaska. Red Mountain is a globally significant advanced VMS project with high grade zinc and silver in two deposits. 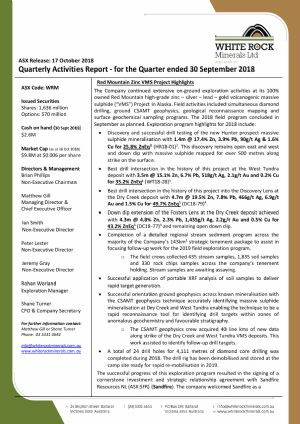 White Rock is exploring for additional high grade deposits that will enhance the projects leverage to an upturn in the fortunes of zinc and silver. 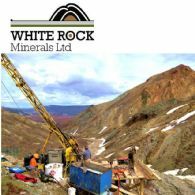 White Rock Minerals Ltd (ASX:WRM) in conjunction with its joint venture partner Sandfire Resources NL (ASX:SFR) is pleased to provide an update on its plans to conduct a comprehensive program exploring for high-grade zinc and precious metals volcanogenic massive sulphide deposits at Red Mountain in central Alaska. 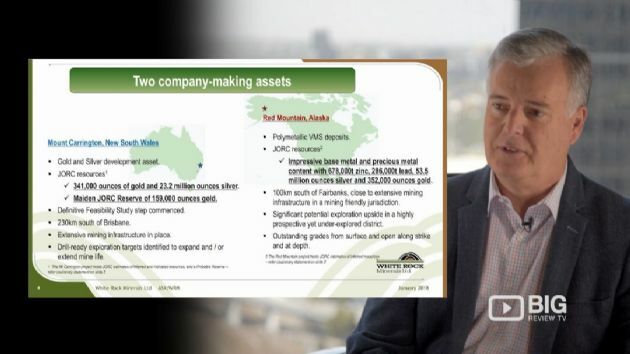 White Rock Minerals Limited (ASX:WRM) and Sandfire Resources NL (ASX:SFR) have joined forces to fund the exploration and development for new high-grade zinc and precious metals volcanogenic massive sulphide deposits at Red Mountain in central Alaska. 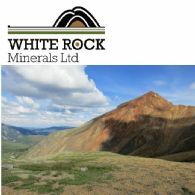 White Rock Minerals Ltd (ASX:WRM) wishes to advise that the podcast of an Interview with InvestorIntel and White Rock&apos;s MD and CEO, Matt Gill at the 2019 Prospectors & Developers Association of Canada "PDAC" Toronto Conference is now available on its website. 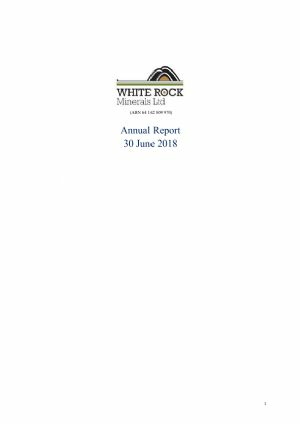 The Directors present their report together with the consolidated interim financial statements of White Rock Minerals Ltd (ASX:WRM) and its controlled entities for the half-year ended 31 December 2018 and the auditors review report thereon. 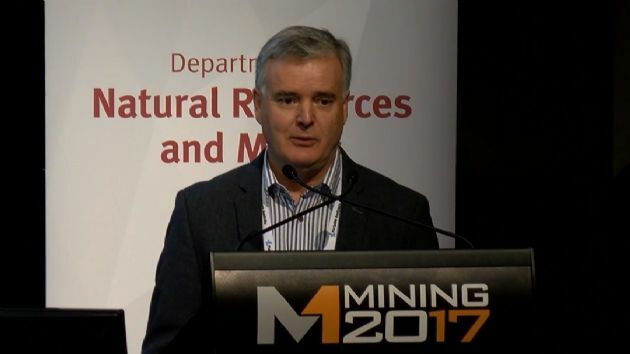 White Rock Minerals Ltd (ASX:WRM) wishes to advise that the podcast of a presentation by its MD and CEO, Matt Gill at the Hong Kong 1-2-1 Investor Conference is now available on its website. The White Rock (ASX:WRM) Board is pleased to announce the appointment of Mr Stephen Gorenstein as a Non-Executive Director. 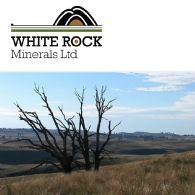 White Rock Minerals Ltd (ASX:WRM) wishes to advise that the podcast of an interview with its MD and CEO, Matt Gill at IMARC is now available on its website. 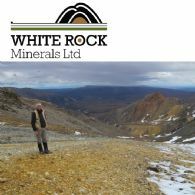 White Rock Minerals Ltd (ASX:WRM) is pleased to announce that it has identified a number of high priority geochemical anomalies within its recently expanded 100% owned Red Mountain high-grade zinc - silver - lead - gold - copper volcanogenic massive sulphide Project in Alaska. 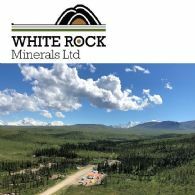 White Rock Minerals Ltd (ASX:WRM) is pleased to announce that it has identified a number of high priority geochemical anomalies within its recently expanded 100% owned Red Mountain high-grade Project in Alaska. 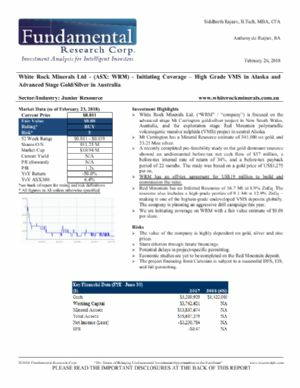 White Rock Minerals (ASX:WRM) is pleased to announce that it has more than tripled the area of its highly prospective 100% owned Red Mountain high-grade zinc - silver - lead - gold - copper volcanogenic massive sulphide Project in Alaska through the staking of an additional 524 new State of Alaska Mining Claims and Mineral Locations.